Please click below to download and print the Retirees Association application form. 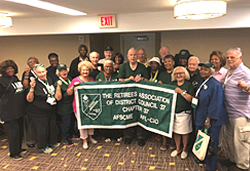 The Retirees Association is open to all retired municipal employees who worked in the jurisdiction of DC 37 at any time in their careers, or who draw benefits from DC 37 Funds, and their spouses/domestic partners. The Association works for legislative, political and social campaigns to defend and improve health insurance, social security, pensions and Medicare. It funds recreational and learning activities for eligible retirees. Retirees living in Florida, North Carolina and Nevada can participate in union retiree “sub-chapters” in those three states. There are no additional dues for members wishing to get involved.